William McGregor Paxton first studied art with Dennis Miller Bunker [91.130] at the Cowles Art School in Boston, one of several independent academies that modeled themselves after the educational institutions of Paris. Paxton followed his teacher’s example and continued his training in France at the Ecole des Beaux-Arts under the tutelage of one of the most famous French academicians, Jean-Léon Gérôme [http://www.mfa.org/search/collections?artist=Jean-L%C3%A9on%20G%C3%A9r%C3%B4me&objecttype=54]. There he perfected his technical knowledge of the human form and his preference for tightly painted, highly finished figure compositions. Upon his return to Boston, Paxton joined his older colleagues Edmund Tarbell [1985.66] and Frank Weston Benson [08.326] as an instructor at the School of the Museum of Fine Arts, Boston. Like many of his Boston colleagues, Paxton found inspiration in the work of the seventeenth-century Dutch painter Johannes Vermeer. Paxton was fascinated not only with Vermeer’s imagery, but also with the system of optics he employed. He studied Vermeer’s works closely, and discovered that only one area in his compositions was entirely in focus, while the rest were somewhat blurred. Paxton ascribed this peculiarity to “binocular vision,” crediting Vermeer with recording the slightly different point of view of each individual eye that combine in human sight. He began to employ this system in his own work, including The New Necklace, where only the gold beads are sharply defined while the rest of the objects in the composition have softer, blurrier edges. 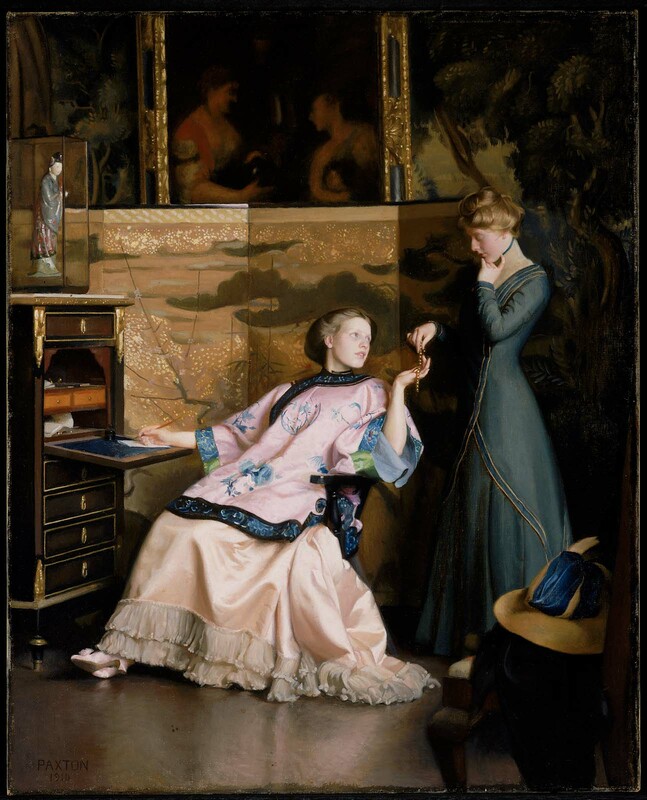 Paxton crafted his elaborate compositions with models in his studio, and the props he used, particularly the pink Chinese jacket, appear in several different paintings. Here he has implied a narrative, involving the discarded letter and the necklace. 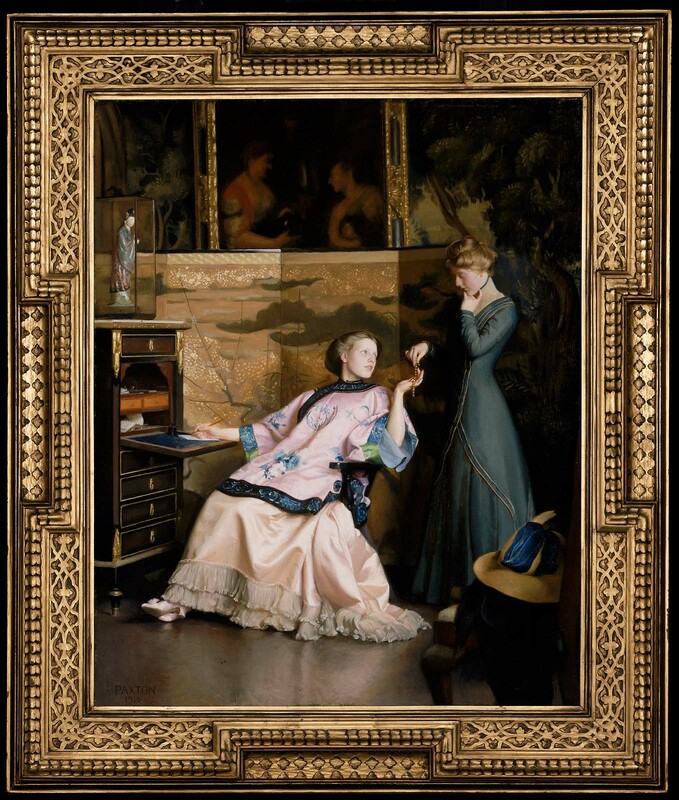 But Paxton allows each viewer to fashion his or her own story; he does not indicate whether the jewelry is a gift from an admirer or a purchase, or what the girl in green might advise her friend. In this way, he also emulates Vermeer, whose narratives are often ambiguous. Paxton enhanced his connection to Dutch art by including paintings within his painting and by selecting a hand-carved frame in a Dutch style for The New Necklace. His image, carefully composed and crafted, was meant to bring beauty and tradition to its lucky owner.